If you wanted, well, pretty much anything, there are about a zillion companies that would happily bring it to you right this minute. It’d probably be delivered by a series of transportation methods, by plane, train, or truck, and when it arrives, it would almost definitely come in a big box full of plastic or Styrofoam. To many, these companies are a revelation. But as Amazon and the thousands of other businesses built around bringing you stuff have exploded in growth, they’ve been met with the same chorus of complaints: They create way, way too much trash. And one of the loudest voices has come from the zero-waste movement, a consumer-led, grassroots group of individuals and businesses coming for the convenience economy. The goal: Create as little garbage as possible. Recycling isn’t enough — only 9 percent of all plastic waste on Earth has been recycled. Among all the adherents of the zero- and low-waste lifestyle I spoke to, the first and foremost tenet is preventing waste from existing in the first place. Although its current iteration may have begun out of individual interest, over the past few years a growing number of zero-waste stores have sprouted up around across the country and around the world, helping both businesses and customers prevent garbage from ending up in landfills. Now, even major brands and cities are joining in, and it’s not all that difficult to understand why. It’s no coincidence that the popularity of zero-waste lifestyles happens to coincide with mounting evidence that climate change will be the defining event of this century. We’ve also only just begun to seriously research the effect of the staggering amount of plastic in our oceans — the first comprehensive count of it by Science just three years ago reported anywhere between 4.7 and 12.8 million metric tons of ocean plastic. Plastic, in modern life, is nearly inescapable — simply washing our clothing, about 60 percent of which is now made of synthetic plastic fibers — releases hundreds of thousands of fibers into the water supply. Waste on dry land isn’t any better: The Environmental Protection Agency estimates that 23 percent of landfill waste comes from packaging and containers. So what’s an environmentally conscious consumer to do? Well, if you’re on the more extreme end of the spectrum, a natural response might be to try and fit all your garbage for an entire year in a single jar. This, at least, was the strategy used by Bea Johnson after her family of four downsized to a small apartment in downtown San Francisco in 2006. Once she realized that they hardly missed 80 percent of the items that were put in storage, Johnson started a blog in 2009 that ultimately got her a profile in the New York Times (headline: “A Visit From the Priestess of Waste-Free Living”). Yet today, Johnson has a book, a couple of TED Talks, and a nearly 200,000-strong Instagram following; plus, she says she and her family are healthier and save around 40 percent of their overall budget thanks to their frugal shopping habits. As for what’s in those jars at the end of the year, exactly? Stickers on produce, caulking from the back of the sink, a piece of duct tape that got stuck on somebody’s shoe, and a filter from the gutters that flew off in the wind. “Really, things that you don’t have a name for,” she says. The visual of a year’s worth of garbage in a jar is a clever gimmick, which is likely why it spread to others across the country. There’s Lauren Singer, who managed to fit four years’ of trash in a single 16-ounce jar and opened Package Free Shop in Brooklyn, and Auri Jackson, who in 2016 produced and starred in a viral BuzzFeed video in which she went waste-free for 30 days. If an individual can’t prevent climate change, businesses, at least, can help large groups of them make more environmentally conscious choices. 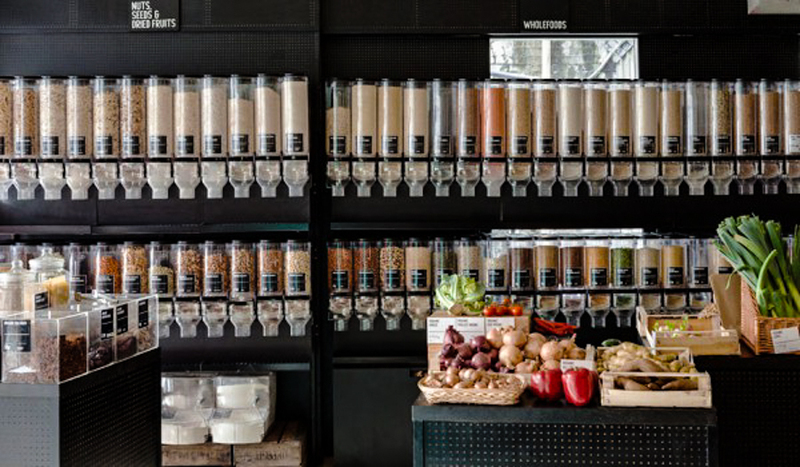 Zero-waste stores in Germany (Original Unverpakt), Austria (Lunzers), Spain (Granel), Italy (Effecorta), the UK (The Zero Waste Shop) have succeeded, but have only recently found a home in the US. One of the first, In.gredients in Austin, Texas, opened in 2012, but closed in April 2018 as a result of low sales. But despite the financial risks, similar businesses have appeared across the country. Zero Market, which opened in Denver in 2017, and the Refill Shoppe in Ventura, California, which opened in 2010, sell mostly home cleaning and body care products in bulk. “At that time, most of the search results I could find for refilling were for printer ink cartridge places,” says Michelle Stevens of the Refill Shoppe. Now, however, that’s not likely to be the case: “We receive emails daily from people trying to open zero waste stores all over the world asking for advice,” says Lyndsey Manderson from Zero Market. “Herbs are difficult because they need to be sealed in a plastic bag to keep them fresh,” says Lyndsey. “Liquids are almost always shipped in plastic containers which we find ways of reusing those plastic containers after they’ve been emptied.” They’ve been able to find local suppliers that allow them to come in with their own glass containers with liquids, “but we still have a long way to go,” she says. At Precycle, a zero-waste store in Bushwick, Brooklyn, owner Katerina Bogatireva echoed many of the same stories and sentiments as other local store owners. Like many of them, she had her own revelatory moment while living in New York after growing up in Latvia during the Soviet Union, where food — and plastic bags — were often scarce. Soon after moving the US, she says, she began to take the abundances of convenient living for granted, however, and realized she wanted to make a change. After three years of planning, Precycle opened in November 2018 and carries bath and home cleaning products, dry goods, and fresh produce, most of which comes from local farmers markets (with the exception of the kale, a customer demand that needs to be brought in from California in winter). She’d like to expand into dairy, which comes with its own challenges, namely that cheese needs to be wrapped in something immediately after it’s made. For those customers that can’t make the journey to the few zero-waste shops available, some businesses are entering the zero-waste delivery space. The Wally Shop, for instance, which is also based in Brooklyn, delivers farmers market-fresh produce in reusable packaging; Fillgood.co does the same for cleaning products in the Bay Area. It’s easy to point out that most of these businesses exist in liberal enclaves in coastal cities, but even some of the world’s largest companies are now taking steps to reduce single-use plastics. In fact, it’s a certifiable trend, with Starbucks, Disney, and even the European Union taking part. Unilever, Nestlé, and PepsiCo all recently announced plans to roll out reusable packaging for certain products in an attempt to reduce single-use disposables. America’s largest grocery store chain, Kroger, has said that it will divert 90 percent of its food waste from landfills by 2020, and eliminate plastic bags by 2025. Ultimately, however, governments and major corporations need to be held responsible, as our individual consumer choices are just a drop in the bucket of their waste creation. In many places, they’re trying, at least. San Diego and Washington, DC, have banned styrofoam and plastic straws, respectively, likely thanks to research into ocean plastics that’s finally revealing the extent of the problem. However small they are, businesses like Precycle are on the forefront of the movement. Awesome post! I know Denver is a pretty liberal town, but we aren’t costal. Anyone looking for zero waste options while passing through the midwest come check out The Zero Market in Denver, CO or Refill Revolution in Boulder, CO!